A cold front is expected to pass through the region tonight. An increase in clouds is expected along with a few sprinkles or a passing shower. For Sunday, a Canadian area of high pressure will begin to build in across the Great Lakes and New England. A weak impulse will swing through our northern areas on Sunday and this could result in a passing sprinkle or flurry. However, with high pressure building in, partly to mostly sunny skies are expected for most of the region. A pressure gradient will be present and tighten for a time on Sunday and this should result in gusty winds. Sustained winds of 15 to 25 MPH with gusts to 40 MPH are anticipated. It will be much cooler on Sunday with temperatures struggling to get any higher than the lower 50s. 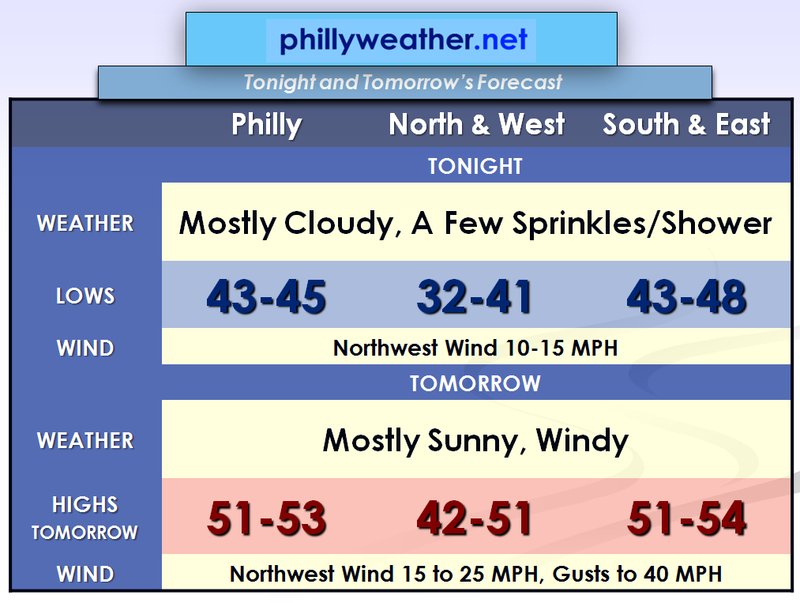 A freeze cannot be ruled out early on Monday Morning in Philadelphia, especially if the winds relax. The NAM is printing out 31 and the GFS is printing out 34. It will be a close call. Outside of the city limits, a hard freeze is quite possible. However, the growing season has already ended in areas outside of the city. 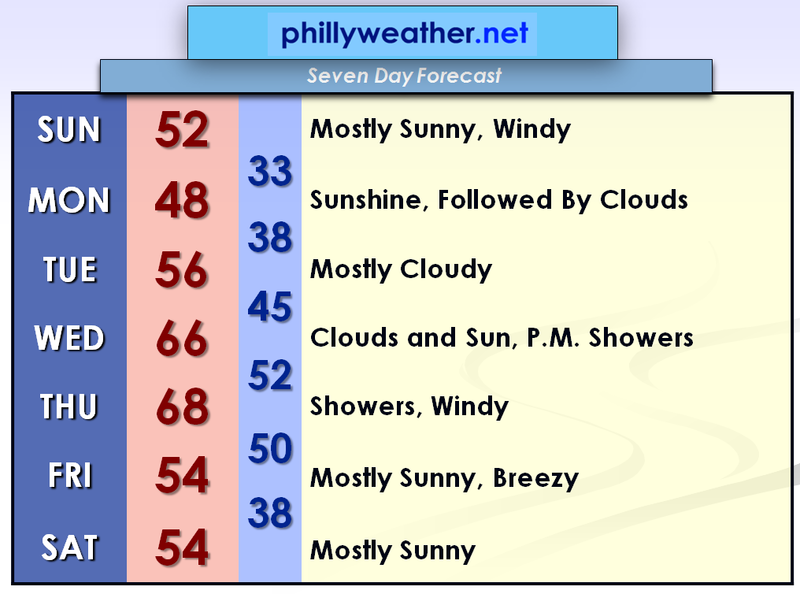 Highs on Monday will struggle to reach 50 degrees. For Monday Night and the majority of Tuesday, an onshore flow is expected. This will likely increase the low level moisture. It will probably be one of these cases where it is cloudier east of Philadelphia and brighter west of Philadelphia. There is a slight chance of a few periods of fog or drizzle as well. However, any fog or drizzle will probably end up being more of a nowcasting type of an event. The main event of the extended forecast should be on Thursday as the model guidance is suggesting a strong cold front passing through the region. Temperatures will rebound midweek ahead of the front and Wednesday and Thursday could be on the mild side with highs in the 60s. As the front approaches and passes through on Thursday, showers are likely. It will probably turn windy with gusty southwest winds prior to the frontal passage and gusty west-northwest winds after the frontal passage.We will have more posted about this late week front on Sunday.